Azaleas are Southern signature plants in South Carolina landscapes. Numerous azalea species, hybrids and cultivars, either native to this area or hailing from the Orient, can be grown here, with bloom times ranging from early spring to midsummer. The numerous cultivars of the Encore™ series of azaleas offer blooms twice a year, in the spring and again in the fall. Azaleas are classified in the genus Rhododendron. The ‘Formosa’ Southern Indica Azalea produces large blooms. In order for azaleas to have healthy, vigorous growth, it is important to understand the impact of cultural and environmental factors on this plant. Choosing the proper planting location and using good planting methods and cultural practices are critical in providing the best conditions for optimum plant growth. For more information on the beginning steps to a healthy azalea, refer to HGIC 1058, Azalea Planting. Azaleas prefer cool, partially shaded sites, such as the filtered shade of pine trees. Azaleas planted beneath hardwoods with shallower roots must compete with these trees for nutrients and water. If placed in the right location, however, they can do well on these sites. Although some varieties tolerate sun better than others, they all prefer an area that is not exposed to long periods of hot full sun and drying winds. Flowers last longer when plants are partially shaded. Azaleas exposed to full sun are more susceptible to lace bugs. Early morning sun exposure after a hard freeze may cause cold injury. Do not plant azaleas in heavy shade as poor flowering and weak growth result. Azaleas are shallow-rooted plants that are easily damaged by excessive soil moisture. They grow best in acid (4.5 to 6.0 pH), well-drained, organic soils. Before planting, have the soil tested and adjust the pH according to soil test results. Azaleas located in poorly drained sites do not receive the oxygen required for healthy growth and often develop root rot diseases. When planting in poorly drained areas, add composted pine bark to as large an area as possible, and plant the root ball higher than ground level. A 2- to 3-inch layer of organic mulch is very important. It conserves soil moisture, maintains soil temperature and helps discourage weeds. There are many materials available suitable for mulching. Pine straw, composted pine bark and leaves work very well, enriching the soil with organic matter as they decompose. 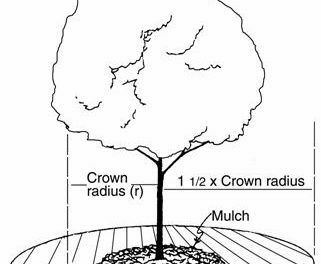 Keep the mulch a couple of inches away from the main stem to keep the bark dry and extend it beyond the outermost branches. Azaleas are shallow-rooted plants and require irrigation during dry periods. This is especially true of those planted in the spring. Azaleas planted in warm weather in sandy soils may require watering of the root mass twice a week during the first year. Azaleas in waterlogged soils will decline and are susceptible to root rot diseases. It is important to reach a balance of regular, deep watering and good drainage to promote a healthy plant. Azaleas have low nutritional requirements compared to other shrubs. A soil amended with organic matter prior to planting followed by a mulch of compost, shredded leaves, pine straw or other organic material will usually provide sufficient nutrients for adequate growth. Before fertilizing, have a specific reason for doing so, such as increasing growth rate or correcting a nutrient deficiency. A nutrient deficiency can be exhibited by a number of symptoms including stunted growth, smaller than normal leaves, light green to yellowish leaf color and early leaf drop. Be aware that these same symptoms can be caused by other problems such as heavily compacted soil; stresses from insects, disease organisms and weeds; and excessively wet or dry soil. Fertilization will not correct those problems, so be certain that you know the cause of the symptoms and treat them appropriately. Having your soil tested is one way to determine if applying fertilizer will benefit your azaleas. Information on soil testing is available in HGIC 1652, Soil Testing. Good quality azalea fertilizers will also contain necessary trace elements. Never fertilize azaleas in the late fall with these high nitrogen fertilizers, as this may delay dormancy and result in plant injury. Apply fertilizer to the azalea’s root zone area (area occupied by nutrient and water-absorbing roots) which can extend beyond the drip line or outer-most branches. According to research findings, a shrub’s roots can extend three times the distance from its center to the outermost branches. So, if the distance from the center of the azalea to the outer-most branches is 2 feet, the feeder roots can extend an additional 4 feet beyond the drip line. To visualize the area to be fertilized, imagine the azalea as the center point of a circle with a 6-foot radius (the “root radius”). Trace the outer edge of the root zone area. Since most azalea roots are located in the top foot of soil, surface application of the fertilizer is adequate. Evenly broadcast the fertilizer with a handheld spreader or a rotary or cyclone spreader over the root zone area. Sweep any fertilizer off the branches and water afterwards to make the nutrients available to the roots. For azaleas growing in a bed, follow the steps below to determine how much fertilizer to apply over the bed to supply 1 pound of nitrogen per 1,000 square feet. If the shrub’s root zone area is confined by a sidewalk or driveway, reduce the area to be fertilized accordingly. Measure the area of the bed, making an allowance for the roots that extend beyond the outermost branches. Let’s assume the bed is 30 feet long and 10 feet wide. The bed area (length x width) is 300 square feet. Apply 2½ pounds or 5 cups of 12-6-6 evenly over the mulched bed. Azaleas do not have to be routinely fertilized during the growing season. Any fertilizer application should be based on their appearance, such as leaf color, growth rate, soil test results and your objectives, such as encouraging growth or correcting a mineral deficiency. The best time to apply fertilizer is when it will be readily absorbed by the roots of the plant and when the soil is moist, which can be any time from late spring (after new growth emerges) up to early summer. Avoid fertilizing plants stressed by drought during the summer months. Without water, plants are unable to absorb nutrients, so it is best not to fertilize if water is unavailable. There are two pruning techniques used for azaleas: thinning and heading. Thinning refers to the removal of branches back to the main trunk or another branch. This method is used to remove leggy branches that extend beyond the canopy of the plant, remove damaged or diseased wood, or reduce the size of the plant. Thinning allows light to penetrate the shrub, encouraging growth on interior branches. You can thin at any time of the year without causing significant impact on flowering, growth or cold hardiness of the plant. However, to reduce the impact on flowers the following year, prune just after flowering in the spring. Heading refers to the cutting back of a branch, not necessarily to a side branch. This method is used to reduce the size of a plant, create a hedge or to renew old overgrown plants. Renew overgrown plants by cutting them back to within 6 to 12 inches of ground level. This practice results in abundant new growth by midsummer. The best time to renew azaleas is before spring growth begins. This allows sufficient time for next year’s flower buds to form in midsummer, and for new growth to mature and harden off for winter. Renewal pruning before spring growth, of course, means that flowers are sacrificed for that year. After renewal pruning, prune the tips of new shoots when they are 6 to 12 inches long, to encourage branching and a full canopy. Thin out new shoots emerging from the old stem. Keep the soil moist during the period after severe pruning. The most common diseases on azaleas in South Carolina include petal blight, leaf gall, leaf spots, dieback, and root and crown rot. The most common insects are lacebug and spider mites. Good cultural practices such as careful plant location, provision of good aeration and drainage, mulching and good watering habits will reduce the incidence of disease and insect damage. For more information on disease and insect problems on azaleas, refer to HGIC 2050, Azalea & Rhododendron Diseases, and HGIC 2051, Azalea & Rhododendron Insect Pests. Iron is essential for healthy azaleas. Iron is available for uptake by azaleas when the soil pH is low (acidic). When soil pH is too high (alkaline), iron becomes unavailable and chlorosis, or yellowing of the youngest leaves, may occur. A telltale sign of iron chlorosis is when the area between the veins is yellow or light green, while the veins are darker green. Application of iron as a foliage spray will usually give quick, temporary results when applied during the growing season. In low pH soils, such as the clay soils in the Piedmont area, iron is readily available. In these soils, chlorosis is usually due to other causes, such as waterlogged or compacted soil, root rot, or injury caused by nematodes or too much fertilizer. The first step to determine the cause of yellowing is a soil test to determine the soil pH. Azaleas are susceptible to cold injury, especially when exposed directly to early morning sun after a hard freeze. The rapid thawing of frozen branches and twigs may result in bark splitting. Sudden early freezes in the fall and late freezes in the spring also cause bark-splitting. It may take several months before the branches die back on winter-injured azaleas with split bark. Prune out affected branches. To reduce chances of bark-splitting, plant only azalea varieties known to be hardy in your area.